This particular field trip for my advanced elective module (AEM), water quality and pollution, was reported in the Straits Times (25 Mar 10). I have decided to post some exclusive footage not captured in the news article. (Actually, these are just routine photos I take every time I head to the field.) In addition, I have included a Google Earth file compiling all the water quality data gathered by the students on that hot and sunny morning. The students were given hands-on practice on the use of Google Earth as a means of documenting water quality data. Figure: The 4 sampling stations displayed in Google Earth. Notice the ugly patch of cleared land. 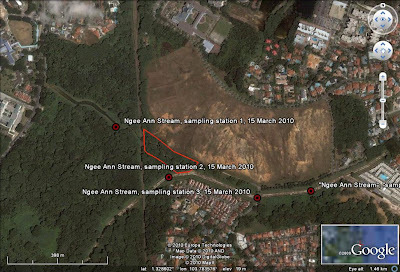 More land has since been cleared as Google Earth satellite photos are back dated. See previous post. Aside to FMSS students in selected groups: Please use the compiled data in the Google Earth file to prepare for your case study presentation. Figure: Group work at sampling station 2. The other point to note is the highly turbid (muddy) water caused by sediments being washed down the canal from the nearby construction site. In fact, the turbidity exceeds 1000NTU which is the measurement limit of our turbidimeter (you may check the data here). This has never been observed before in this stretch of water. Figure: Moving on from station 2. The canal floor was still wet from the drizzle earlier in the morning.